The Honors Program administers high academic standards. Honors Program staff are responsible for tracking student performance and ensuring that Honors graduation requirements are met. Staff members maintain regular communication with Honors students to update them on their status within the program, to remind them of important deadlines, and to help them to succeed in their academic endeavors. To maintain "good standing" in the program, Honors students must meet minimum GPA requirements, complete their Honors curriculum in a timely manner, and maintain good character. A student's Cal Poly cumulative GPA is used as the primary measure of academic performance. This GPA must be at least 3.3 at the end of a student's first year. By the end of the second year, this GPA must be at least 3.4. By the end of subsequent years and at the time of graduation, this GPA must be at least 3.5. Students not meeting these academic standards may be disqualified from the Honors Program and prohibited from enrolling in Honors courses. Honors probation exists for freshmen students earning a Cal Poly cumulative GPA below 3.3 at the end of their first year. A student on probation is given time during the sophomore year to improve his/her academic performance. A student not meeting the terms of his/her probation is disqualified from the program. Any student disqualified from the Honors Program may apply for reinstatement once he/she demonstrates improved performance and meets the minimum academic standards. Honors Program staff and faculty members are available to advise students on academic matters. Students are encouraged to work closely with these individuals to develop study plans for achieving Honors goals. Current Cal Poly Honors students are encouraged to visit the Honors Program site in PolyLearn for more information on academic standards. A link to this site is found in the My Cal Poly Portal. Please contact the Honors Program office if you have difficulty locating this information. To graduate "with Honors," all Honors students admitted to Cal Poly as freshmen must complete the following curiculum. 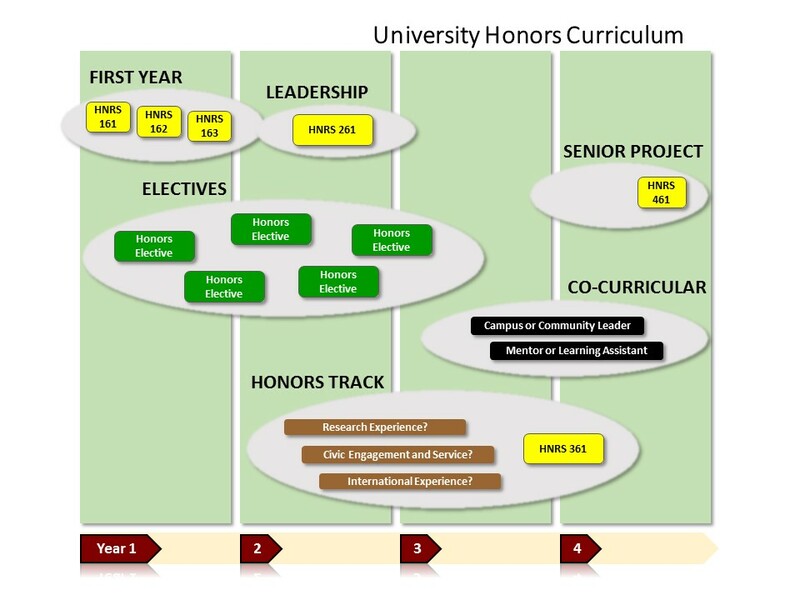 Admitted transfer and continuing Cal Poly students should contact the Honors Program office regarding their curricular requirements. A 1-unit Honors Capstone Seminar (HNRS 461) designed to link a student’s senior project with Honors Program learning objectives. HNRS: Courses with this prefix are primarily General Education (GE) courses available through different campus departments. GE Honors courses represent alternatives to the regular GE course offerings and are degree applicable for nearly all majors. These courses are reserved for Honors students and have a lower enrollment cap (25 students). The subject matter in these courses is explored with greater depth and intensity. In addition to GE courses, campus departments may offer cross-listed HNRS courses or HNRS seminars; these courses are not necessarily restricted to Honors students and may be degree applicable, depending on the major. HNRC: Honors "contract" courses allow students to receive Honors credit for different extracurricular and co-curricular experiences available at Cal Poly. If approved by the Honors Program, a student may receive HNRC credit for a summer internship related to his/her field of study, leadership experience gained under a campus student organization, community service undertaken with a local community partner, or study abroad experience. In addition, HNRC credit may be earned by incorporating an Honors experience into an existing non-Honors course required as major or support under a student's degree program. Enrollment in any HNRC course must be pre-approved by the Honors Program Director; retroactive credit is not granted. Capstone Project: Honors students complete their capstone project (a.k.a. senior project) under the direction of their major degree program. A faculty member from the student’s major typically serves as the project advisor. The capstone experience is completed during a student’s senior year, typically during the final two quarters in residence. Some majors administer year-long capstone experiences. Current Cal Poly Honors students should to visit the Honors Program site in PolyLearn for more details on course and curriculum requirements. A link to this site can be found in the My Cal Poly Portal. Please feel free to contact the Honors Program office if you have questions. The Honors Program offers avariety of Honors courses every quarter. The number of Honors courses offered each quarter depends on several factors, including student enrollment, instructor availability, and departmental/program budget constraints. Honors students who pre-plan their course schedules several quarters in advance, allow for some flexibility in their general education course selections, and communicate regularly with Honors Program staff will complete their Honors graduation requirements in a timely fashion. Several different paths to graduation “with Honors” are possible; the curriculum incorporates some flexibility. Students are strongly encouraged to contact the Honors Program office with questions regarding Honors courses, curriculum, and scheduling.